Our world, our countries, and our communities are facing great challenges, from conflict to inequality to natural disasters. These issues stretch beyond borders and across cultures, demanding our collective attention, collaboration and best thinking. GHR Foundation and OpenIDEO are conducting three BridgeBuilder challenges, each of which awards $1 million to ideas that address urgent global challenges in radically new ways. BridgeBuilder invests in the building and repairing of unique bridges between people, organizations, issues and beliefs at the intersections of peace, prosperity and planet. In doing so, BridgeBuilder aims to promote meaningful engagement, greater social cohesion and sustainable, community-rooted change. 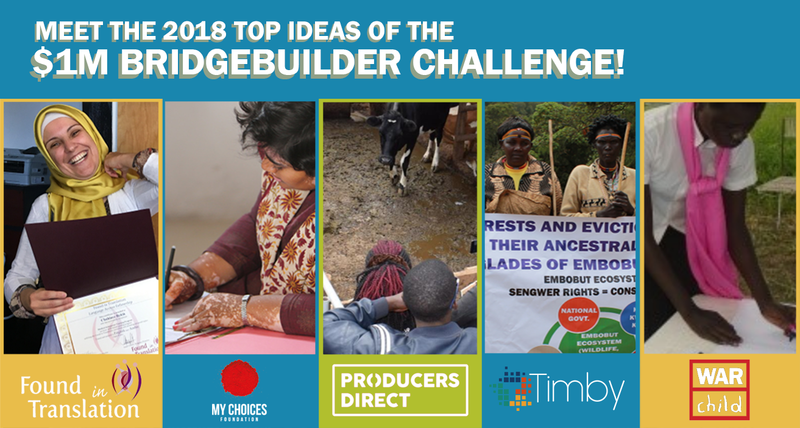 The first BridgeBuilder Challenge in 2017 collected more than 650 ideas from participants in 185 countries, all building bridges in unique, innovative ways. These were narrowed down to five Top Ideas, which convened in Rome for a workshop with GHR and OpenIDEO staff. These wide-ranging ideas are already underway, with project scopes between 12 and 36 months. In 2018, the second BridgeBuilder Challenge focused on reach and accessibility, translating the Challenge materials into seven languages. Interest and engagement grew, with more than 675 ideas and 6,000 comments on the platform. From these ideas, we selected five promising, creative, game-changing ideas to each receive a share of $1 million. We invite you to check out these Top Ideas as they enter the early phases of their projects, and follow along as they building bridges that transform their communities and the world.